The fans celebrate Hereford United’s 2–1 victory over Newcastle. February 5th 1972 at Edgar Street, Hereford. Black and white photograph of fans celebrating Hereford United’s 2–1 victory by storming the pitch. 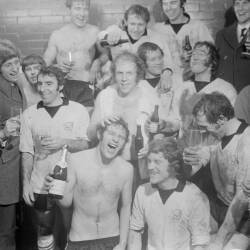 February 5th 1972 at Edgar Street, Hereford. Hereford United’s victory over Newcastle United is generally considered the greatest FA Cup shock of all time.